This past week on the 4th of July (while we were on our CA vaca), my festive shirt choice for the day was this new American flag Mr. Incredible tee from Fifth Sun! I posted the above photo on Instagram (that's me at Oceanside Beach; anyone reading this from that area?) and got flooded with messages asking me where I got it. People really seemed to dig it! It's a super cool t-shirt for sure, and with Incredibles 2 on its way in less than a year, it's no wonder people have The Incredibles on their minds. I really like the red heather color and the distressed/vintage graphic of the heroic Mr. Incredible against an American flag. It's really striking! It's soft (cotton/poly mix) and fits well (not super fitted, but not boxy either) with a retail price of $19.95. 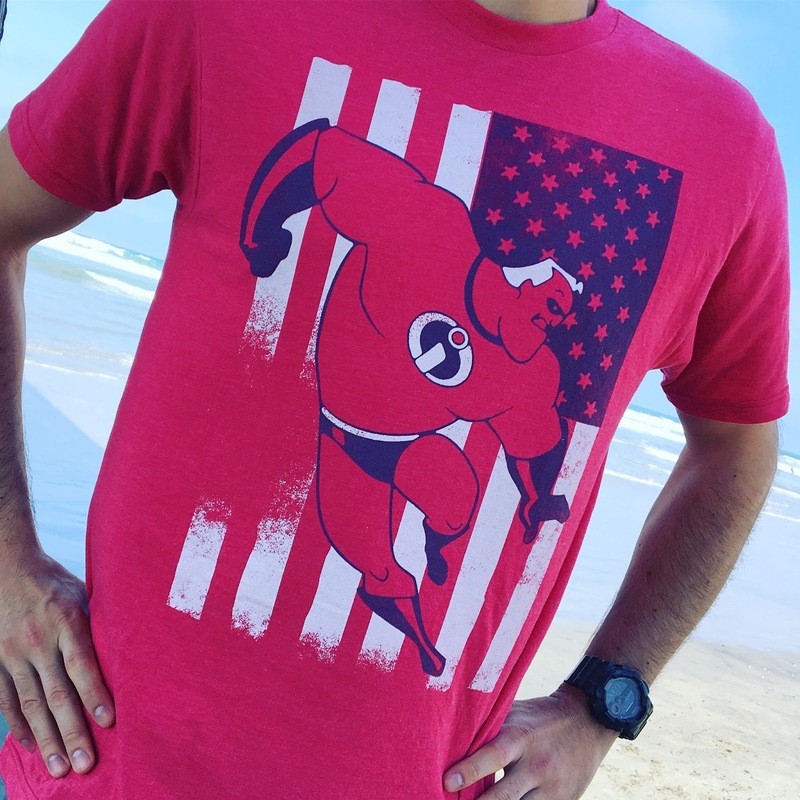 This is a great summer tee; especially perfect for Pixar fans to wear on Memorial Day or the 4th of July. Pick it up before it's gone on the Fifth Sun website HERE and be sure to browse their online store for MANY more awesome Pixar shirts! They have an amazing selection of tees with some really fun designs. A big thanks to my wife Brita who surprised me with this a little while back. Shout out your thoughts in the comments below and thanks so much for dropping by!